Kart Racers are some of the most fun, party-oriented racing games that people can play. For an inconceivable amount of time the title of the best kart racer was undisputedly defended by Mario Kart. That was until Sonic joined the fray with his own racing series – Sonic & Sega All-Stars. Last year’s instalment proved to be a massive hit with console owners and now that fun has been ported over to the mobile platform. 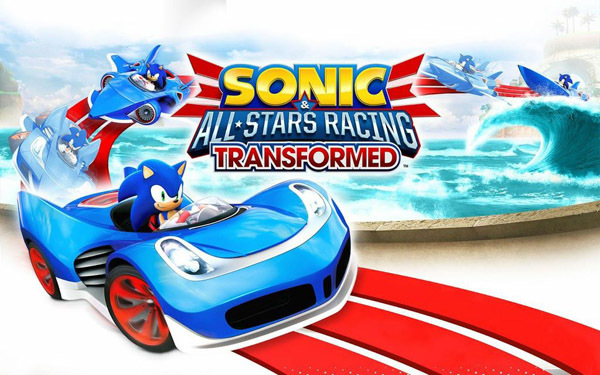 Sonic & All-Stars Racing Transformed is underlined by bright colours, a loveable yet nostalgic cast and awesome level design which all combine together to make the first major kart racer to hit the mobile platform to be by and large a success. While Sonic & All-Stars doesn’t bring too much new to the world of kart racers, what it does bring is a lot of fun. It all boils down to the standard formula of racing a bunch of colourful characters around a track, while picking up items to impede your opponent’s progress. The game’s single player experience is split into either Grand Prix or World Tour Mode. Grand Prix is the same as you would come to expect from a racing game – pitting you against a bunch of AI-Controlled racers through a series of tracks. World Tour is where the game really gets interesting. World Tour has you playing against the AI but with slight twists and deviations. Each stage typically has a set challenge or theme to race through. These challenges can range from standard racers to drift challenges or even races that take place entirely in the air. There are five different World Tour campaigns with 8 events in each for a total of 40 events for players to race through. While single-player is a big part of the game, this is a racer and that means we need some sweet multiplayer. Luckily Sonic & All-Stars brings it in spades. 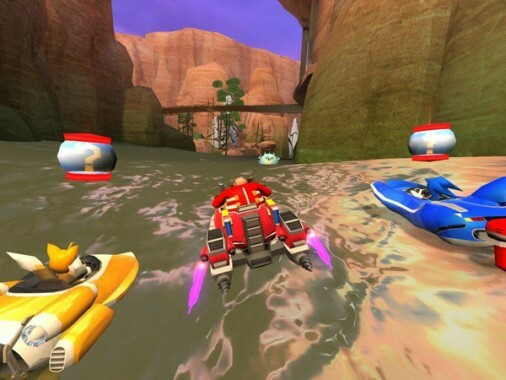 Players can race alongside their friends through local cross-platform play, or also against strangers across the net using Game Center. The controls for the game itself can be a little difficult to pick up and play. While most mobile racers have you controlling the direction by tilting the device left or right, All-Stars goes back to the old virtual thumbstick. The thumbstick can be a little unresponsive at times, forcing you to oversteer in order to maneuver your kart properly. Many players will adapt to this rather quickly but it is still a little jarring when you first start playing. Sonic & All-Stars is actually a really nice game to look at. While it isn’t pushing the boundaries of the the iPhone’s hardware it features a bright colour pallet and a set of wild and varied race tracks that just look great. The game features a slew of different racers that showcase not only the sonic family, but also a bunch of Sega heavy hitters. Disney’s Wreck-It Ralph also joins the ensemble with his signature look. Seeing all of these different characters racing against one another is a dream come true for anyone who grew up with the infamous hedgehog and his crew. The race tracks all look amazing and are completely different from one another. 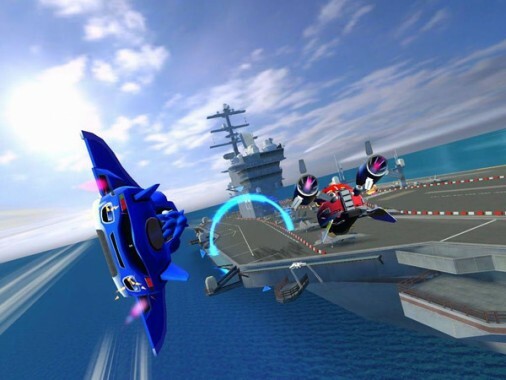 The game keeps you on your toes with level design that changes rapidly (making use of boat and plane transformation mechanics similar to recent Mario Kart titles) leaving you wondering if it was even the same stage to begin with. The game sounds just as good as it looks. The soundtrack is composed of a bunch of songs that franchise fans will immediately remember and that all manage to fit perfectly with the theme and tone of the game as well as the individual levels. The sound effects of lobbing a firework bomb at your friends are satisfying and reall capture the spirit of the game perfectly. 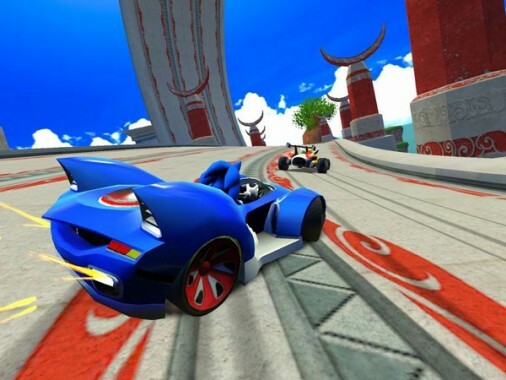 Sonic & All-Stars Racing Transformed is an enjoyable kart racer for mobile devices. While I doesn’t bring anything overly new or exciting to the table, what it does present is a lot of fun. Some awkward controls may hinder players initially but you will quickly adapt. The games biggest draw is without a doubt the ability to play online, no matter where you are. Sonic & his friends have definitely made the successful jump from console to mobile.